If you have that desire to add life to your bedroom, you have a long list of choices on what you can do. 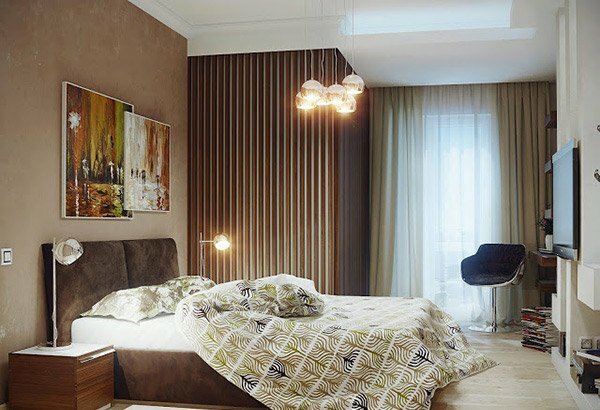 You can create an accent wall or you can even make a beautiful headboard which can be the focal point of your bedroom. You can also add some wall decorations or maybe add a burst of colors for your bed coverings and even for your storage areas. Well, how about putting some paint or wallpapers in your bedroom? You can do that, too. 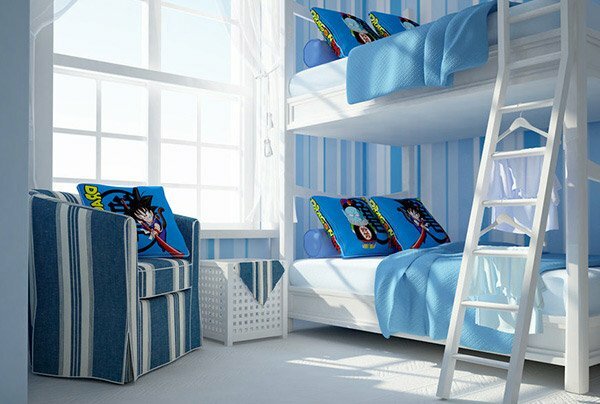 The twins who occupy this bedroom would love the feel of this room with blue stripes and additions of their fave Dragon Ball characters printed on the pillows. 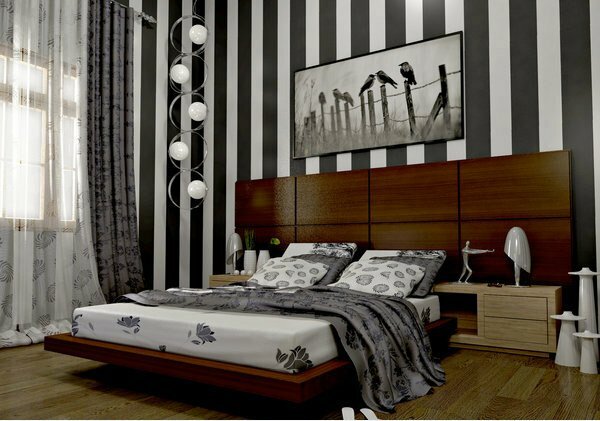 Walls in striped black and white made this bedroom look larger driving the eyes of those seeing the room right into the ceiling. The platform bed also made a difference to the entire look. Luxury and sophistication is spelled between each line for this bedroom. 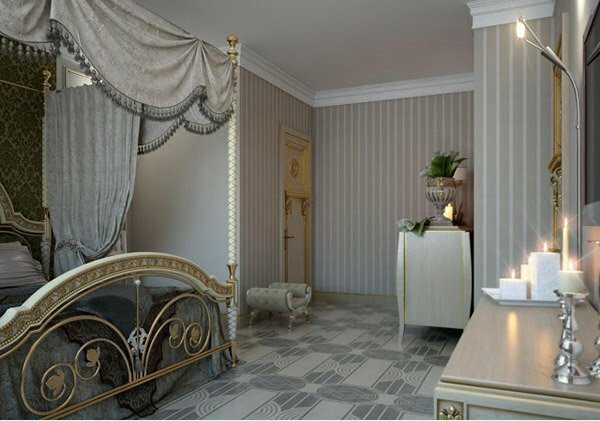 You can see the canopy bed that seems like that of royalty and the usage of decorative floor tiles paired with striped walls in muted tones. 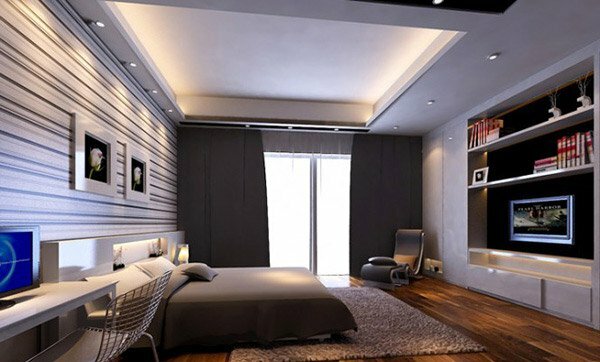 If you are looking for a modern contemporary bedroom with minimal design, then this can be the kind you need. 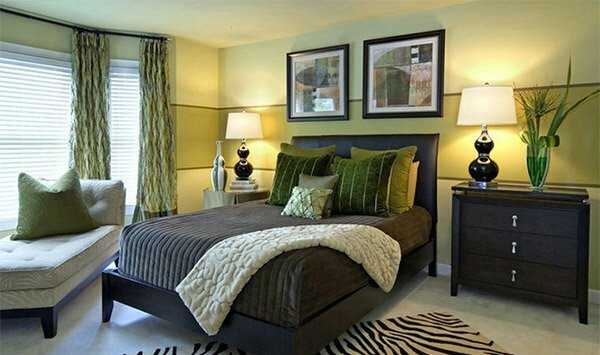 The headboard area sure is well designed which was given more highlight with the striped accent wall. The striped area that you can see is the only part of the bedroom that has stripes on it. A good way to conceal a wardrobe isn’t it? It seems like this room is shouting “spring” because of all the floral accents and the spring colors that you can see in it. Vintage, avant-garde and chic touches are seen in this bedroom for a little girl. The wall is done in grungy stripes with decorative frames and a canopy in sheer white fabric. Love blue? You’ll find this room totally lovely especially with its choice of light blue shade that made this room look so cozy and inviting. 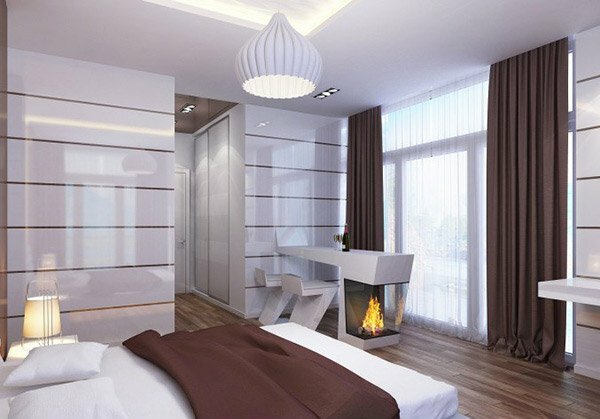 Talk about modern minimalist approach and you’ll certainly think this bedroom can qualify. 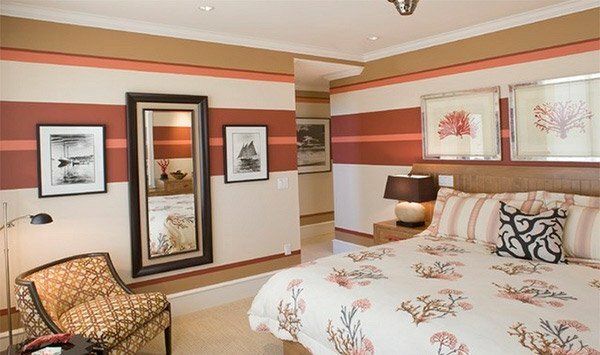 The addition of the colorful striped wall on the sides is a good way to add life to this bedroom. 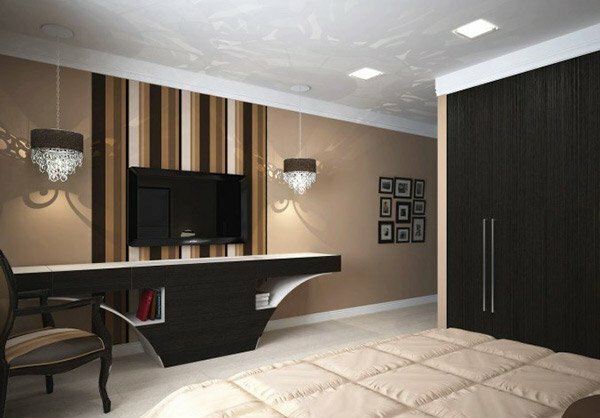 This modern bedroom with horizontal stripes on one side of the wall is surely one the best designs that you have seen. The arrangement of is also very good giving a lot of space for getting around the room. If you do not like to us stripe in a large area, why not use it for a small area like this one? It also did the work well especially that it combined the colors used for the different parts of the bedroom. You will doze off to sleep if you have a green bedroom as calming as this one. Big stripes were used instead of small or thin ones. Your eyes will surely be brought right into this striped area with a big flower design in watermark. Well, it looked good especially that other elements in the bedroom are in white and gray. Who said you have to work on stripes close to each other? You can also do it like this one using a variation of distances to create a unique space. Thin brown stripes were added to the white walls which no doubt have enhanced its look despite the minimal touch. 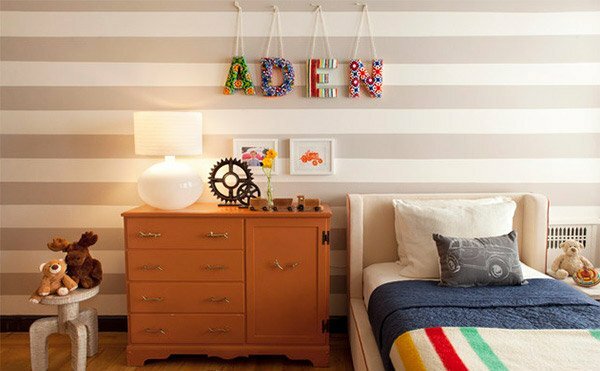 A little kid’s bedroom looked lovely with the striped wall. The decorations also added beauty to it. Using stripes create continuity to the walls of this bedroom which seems to be located under a stairs. The room looked totally teeny with its choice of colors and patterns. Not just one but two patterns were used for this bedroom in green. Damask patterns for the headboard and striped patterns for the other side of the wall. Well, not bad combination though. Stunningly blue with a touch of royalty. 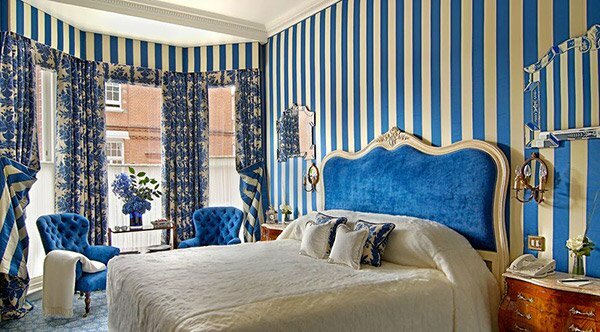 Like the previous entry, this one also used damask for the curtains and striped patterns for the wall. A cute bedroom in pink that certainly is for a little lady or a grownup who love cuddly and soft stuffs. 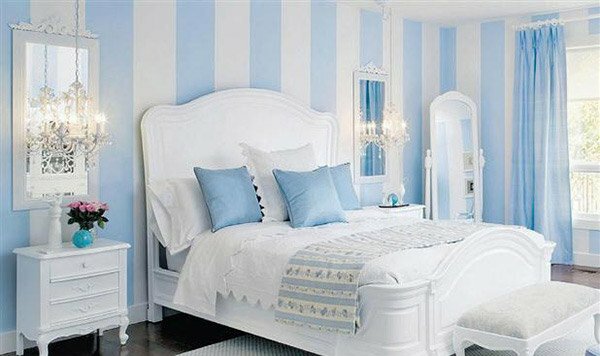 Striped bedrooms look good right? The good thing about this is you can be creative on how thin or how thick your stripes are. You can also play with different colors that you will use for your striped wall. Also, you can use either paint or wallpaper. Bedroom mural wallpapers can also be a good way to add more life to your bedrooms.